Just five dollars allows us to provide an individual with a sack containing basic essentials including food and hygiene products. Every donation does more than you think. Every dollar donated allows us to cloth, feed and help those facing homelessness. Pay a Sack Forward uses every dollar to make direct and social change and nothing goes to waste. These are distributed by our volunteer team, and through our partner organisation’s including food vans, drop in centres and outreach services. Sacks are distributed by our volunteer team through our network of partner organisations including food vans, drop in centres and outreach services. We are extremely lucky to have an amazing team of café’s and businesses who have been generous enough to donate some of their counter space to display our donation tubes. Our supporting cafe’s have played an integral part in helping move PASF from a small concept into the real and tangible program that it is today. Through their passion to help create change, they continue to help spread awareness through the community whilst generating much needed funding to provide support and care to those who need our sacks the most. To check out our cafe network, click here to find the supporting cafe nearest you. Are you a School or Business? If you’d like to host a fundraiser, please get in touch for more info. Additionally we provide our support partners such as drop in centres, food vans, outreach services and community groups with bulk product supply, food supply for weekly meals, and clothing from our op shops. Emergency accomodation is our latest area of interest and support, specifically in the form of home share. 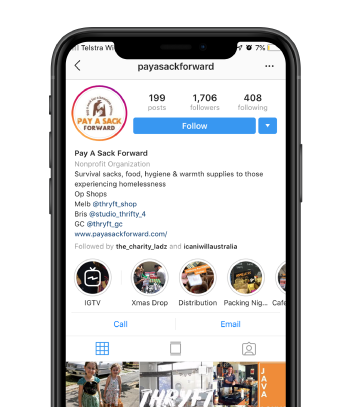 At pay a sack forward we are committed not only to the support of those experiencing homelessness but also those highly at risk of homelessness. Your donations help assist 55 people a month and with your help, we can do more. We encourage you to pop into one of our amazing cafe’s, grab a coffee and make a donation. Just by doing so you are not only helping those living rough but also the people that support us as we grow. Follow us and Share on Facebook and Instagram to spread the love. If you’d love to get involved to help bring happiness and comfort to those who need, get in touch.